It’s about that time of year when everyone is about to start heading out to the pool. Now, safety is paramount when it comes to maintaining and keeping a pool. A fence can make a huge difference for your pool’s safety and the safety of your family while they swim. If you’d like to learn more then settle in and read more. Let’s do this! What can a fence do for your pool? First off, a fence can keep unwanted visitors out of your pool. The added security is always nice. Another thing a pool fence can do is keep your children out of the pool area when they cannot be monitored. A locked fence will keep even the sneakiest of kids from trying to go for a swim without permission. Though they may not like it, this is for their own safety. Keeping to pool codes is what we do! 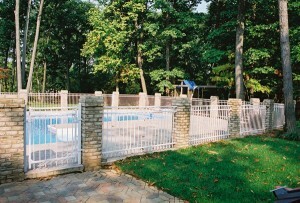 When it comes to building a fence around a pool in MD, we’re your guys. We know the ins and outs of pool codes throughout Maryland, so you won’t need to worry. We even have a whole page dedicated to it if you’d like to find out more for yourself. Not meeting the codes for your area could lead to issues down the line, but don’t worry. We’ll handle that part. Make sure to stay safe out there. Whenever you head out to your fenced pool, you should always practice safe pool etiquette. This includes not running around the perimeter and always swimming with a buddy. You should also have at least one person with CPR certification present in the case of an emergency. Ready for your new pool fence?